The refreshing month of May, as the link between spring and summer, for street art lovers usually marks the beginning of a period filled with festivals, events and showcases. Walls all around the world are being painted and our quest to find and showcase them on our Instagram page turns into pure pleasure. These past 31 days have been no exception when it comes to splendid murals, created on buildings in Germany, Russia, France, the UK, the US, Australia. The man who probably marked it all was Banksy, who finally painted a mural about Brexit, although several months after it happened. 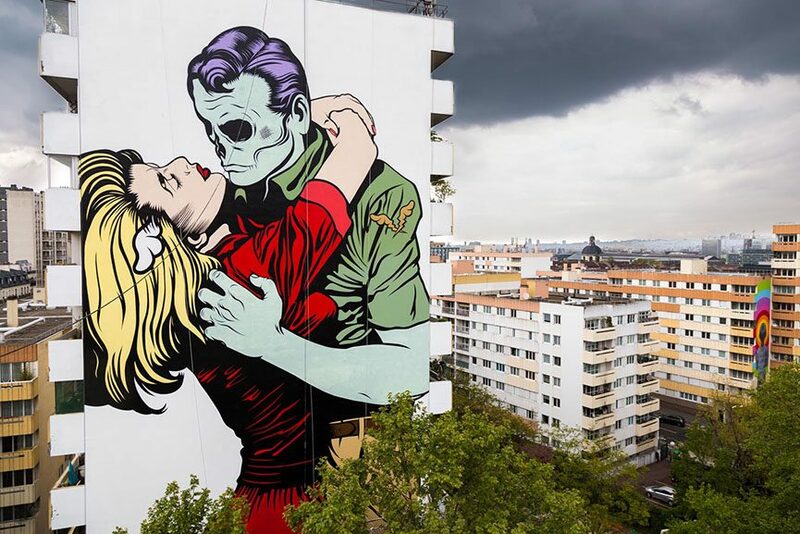 Nevertheless, it was an exciting month and as we look at June, we also take a look back at the most beautiful murals painted by our favorite urban artists. Guido Bisagni aka 108 recently visited Saint Petersburg in Russia, where he painted his largest mural to date, and on the walls of the local Street Art Museum too! The artist is known for his highly abstract works, often featuring thick black forms and shapes against a bright background. Currently, the art of 108 is featured in an exhibition at Affenfaust Galerie in Hamburg. Another piece for Street Art Museum in Saint Petersburg, Russia, is the one by Italian artist Millo. Titled Rivoluzione (Revolution), it features his signature black and white constructed world with only splashes of color here and there. Here, we see a boy in a universe of planets and urban landscape. 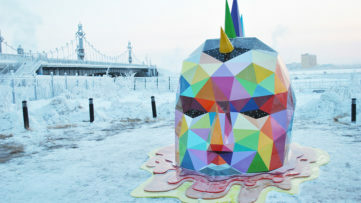 The artist focused on a meaning of the world “revolution”, which is connected to the orbiting of one heavenly body around another. RADNapa in California is The first art district in the Napa Valley to include a diverse representation of art. Floating Napa is the latest mural painted there by Cinta Vidal, a Barcelona-based artist whose practice involves painting of floating everyday objects in figurative style. Here, she painted a series of flying houses across the wall next to the railway. Australian artist Guido van Helten was once again productive in his home country, this time teaming up with filmmaker Seline Miles for Red Bull Curates. 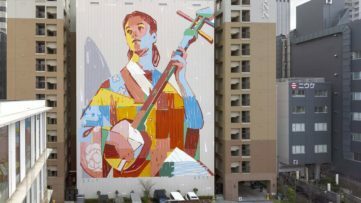 His is an astounding mural entitled Jigsaw measuring 135 meters in length and is 12 meters in height, painted separately on shipping containers which are then put together for the final piece. If you live down under, this was a happy month for you, ‘cause here’s another mural painted there. This past April in Port Adelaide, there was the Wonderwalls festival, which gathered many creatives from the field of street art, including Inti, who made this piece at Warrawee Dock. From what we can tell, it is a faceless clown painted with the artist’s trademark yellow and purple hues. In Perth, the Telmo Miel duo painted a piece under the curatorship of Sherrie Wilson Projects. 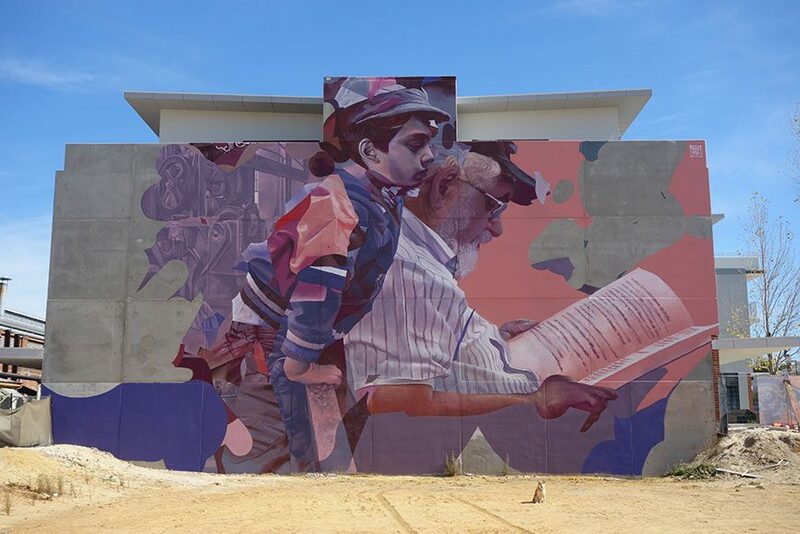 Called Life of a Story, it sees a grandpa reading a story for his grandchild, and it is placed in a particular area in Midland, where the railway workshops gave families an income for generations – a place with a lot of positive stories that will be passed on for decades to come. Everything he does, even the smallest thing, ends up being headline in major newspapers around the world. 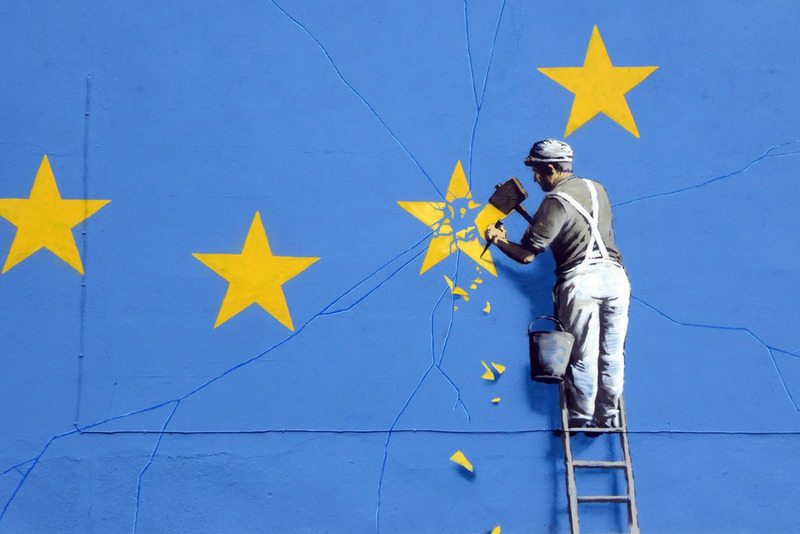 This was the case with Banksy’s latest mural in Dover, featuring a worker on a ladder chiseling a star from a flag of the European Union, marking the United Kingdom’s last year’s referendum on Brexit. We finally got a comment from their most famous street artist, but many consider it to be a little late to the party. “Candy Colored Psychosis” is how Hueman describes her own art, and we couldn’t agree more. 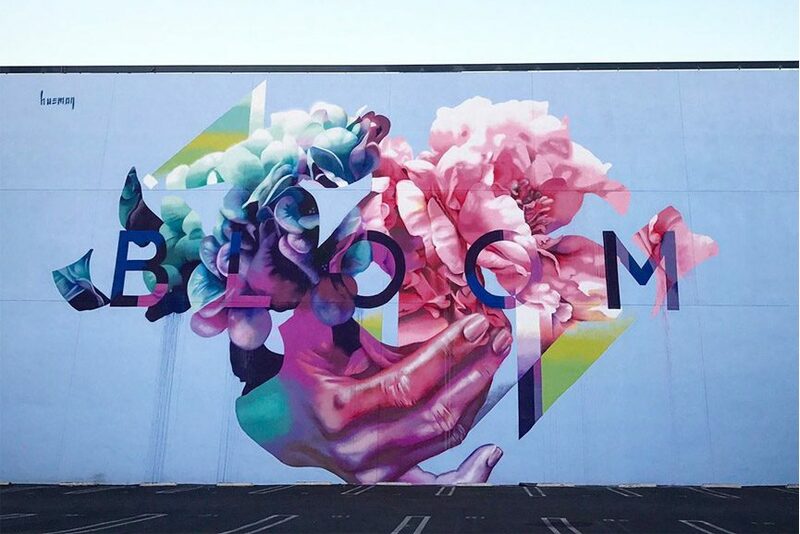 Her latest wall found a place in Los Angeles, in a vibrant new mural featuring a writing saying “BLOOM” and embellished with a hand holding flowers. We just can’t stop looking at it. The cultural route “Kulturweg“ takes place for 3 months in occasion of the garden show 2017 in Pfaffenhofen, Germany. Including 20 different stations, the culture route is linked between exhibitions, galleries, sights and the garden areal. 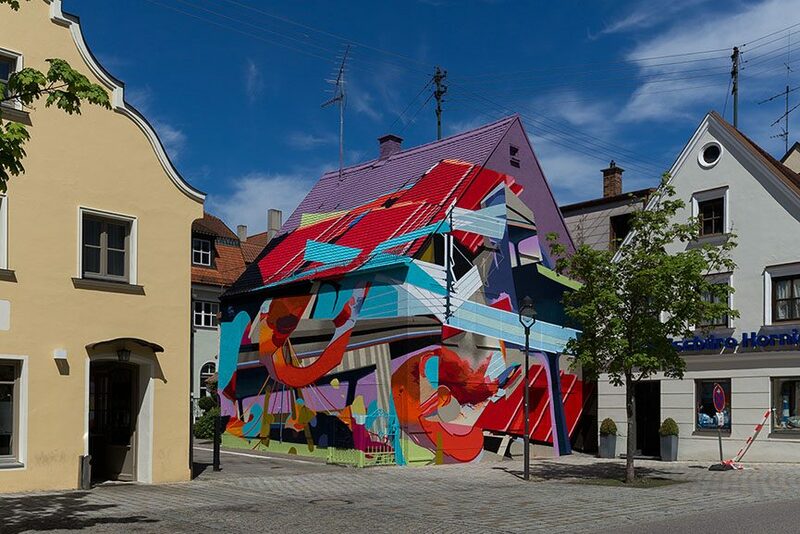 Among the 15 regional and internationally known artists who took on the public space to make installations and mural paintings is SatOne, who painted an entire house as part of an artwork titled Under One Roof. 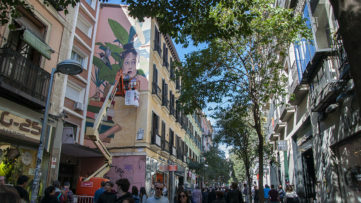 See the 4 New Murals in Madrid, Courtesy Urvanity Art 2019!